Did you know that milk baths have been used throughout history by women all over the world? Strong powerful women, such as Cleopatra, Elizabeth the First and Elisabeth of Bavaria. Back then milk baths were only for the rich and powerful, but guess what, times have changed, and I’m pretty sure that if you were to go look in your fridge, right now — you would find milk! This luxurious, sweet smelling, three-ingredient milk bath will leave your mind & body feeling calm and soothed, and leave your skin feeling fresh and silky-smooth! It also works great for providing relief to skin pain or itch caused by sunburn, bug bites, and even poison ivy. 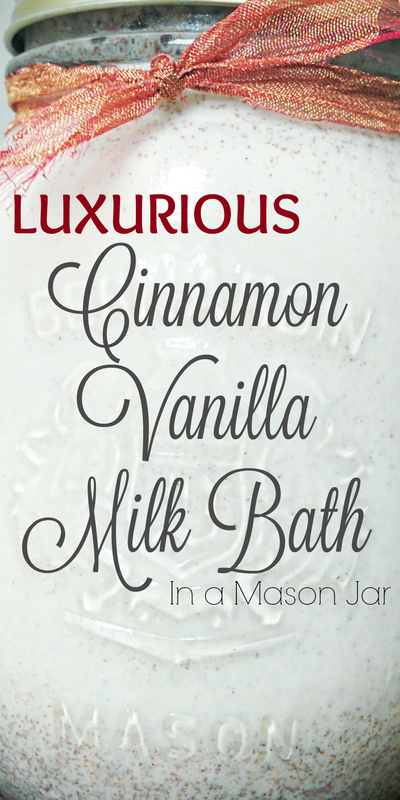 The best part about it, is that you can easily whip up this cinnamon vanilla milk bath in less than 5 minutes, using ingredients that almost any family household is guaranteed to have in stock! Step One: Add all ingredients into your mason jar. Step Two: Fasten lid tightly, and shake, shake, shake! Step Three: Add to your bath water. Tip: Try substituting the milk for 10% or 18% cream for an extra creamy and luxurious bath! This entry was posted in HOMEKEEPING, LIFESTYLE, MY RECIPES and tagged Bath, Beauty, Calming, Milk, Milk Bath, Mind, Remedy, Silky, Smooth, Smooth Skin, Sunburn by Sarah. Bookmark the permalink. Do you use powdered milk or just normal milk? Oh my goodness!! Darn stomach flu… Hope you’re feeling better soon!! Do you need to keep this in the fridge?